Enter the world of Narrow Gauge!!! 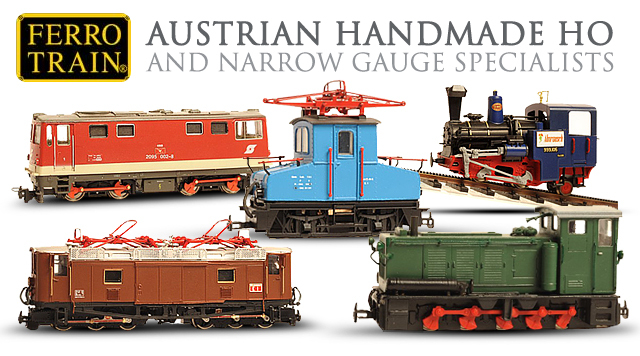 Many modelers around the world have combined HO and Narrow gauge trains on their layouts. Reynaulds specializes in both Hoe and Hom narrow gauge trains. Check out Tillig, Liliput and Roco for many exciting trains, rolling stock and track systems. Keep in mind Tillig produces special combination HO/HOe and HOm track. They produce dual gauge flex track and Bifurcation turnouts, which are also dual, gauge. Tillig offers regular HOe and HOm turnouts, flex track and rail shifts. Rail shifts are straight HO track with narrow gauge track in the center. Narrow gauge loco’s can travel from right to left and visa versa. We are big fans of narrow gauge trains because adding them to your HO layout makes the whole layout much more interesting. Choose a manufacturer below and look for Narrow Gauge, HOe, or HOm to see trains, buildings, accessories and more.